Treat yourself to the hospitality of the Crown Choice Inn and Suites Lakeview and Waterpark directly across the street from two Mackinac Island Ferry Docks. Whether you are vacationing in Mackinaw City with your family enjoying a romantic getaway or staying overnight for business near Mackinaw City you can choose from several spacious suite designs experience our excellent amenities and enjoy the unlimited natural and historical points of interest the Mackinaw City area has to offer. 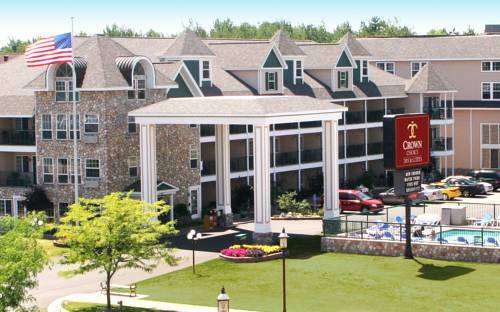 Our Mackinaw City location features all the fine amenities travelers have come to expect from a AAA 3 Diamond hotel. and also the largest indoor waterpark the bucket 3 waterslides geyser jets crawl tunnels water guns and climbing nets. 72000 gallons of indoor waterpark fun. We have recently upgraded many amenities including our Business Center Deluxe Fitness Facility Breakfast Room Conference Room Game Room and Guest Laundry. The Crown Choice Inn and Suites also offers the largest Conference Room and Banquet facilities in Mackinaw City plan your next event with us. Come enjoy your stay in Mackinaw City at the Crown Choice Inn and Suites.